Anyone can SELL with us! 1. Click the REGISTER TO CONSIGN box below and login or create your JBF profile. Choose our Nashville Music City Event and click the consignor box. 2. COMPLETE your consignor reservation by scheduling your Drop-Off appointment HERE. HEY FRIENDS, YOU GOT THIS! We're here to help every step of the way with resources on this page and personal support when you need it. We know your time is valuable. Did you know we even have a talk-to-tag feature that makes your tagging a snap? Bring your items to the Nashville Fairgrounds on the designated days and we'll take it from there. *IMPORTANT! YOU MUST SCHEDULE YOUR DROP-OFF TIME HERE TO COMPLETE YOUR CONSIGNOR RESERVATION. Receive your secure eCheck fast within less than 2 weeks! 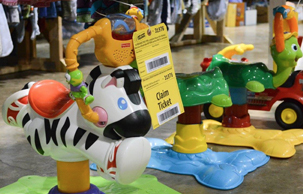 Consigning is where parents like you sell items new and gently used items their kids no longer need to other parents looking for the same thing. Consigning with us is EA$Y and puts money back in your pocket without all the hassle of haggling at a yard sale or driving to meet a stranger! Consignors earn 60% on sold items. Want more? Consignors who help earn up to 75%. There is a $12.00 consignor fee that will be taken out of your earnings check (so NO UPFRONT fees). **Minimum of 25 acceptable items. NO Maximums! 1. Click on "Register to Consign" to the right to get your JBF Consignor #. Next, choose our local Nashville event and then check the consignor box. 2. Next, Schedule your drop-off appointment HERE. Our tagging system stays open 24/7. You can tag at any time. We are run entirely by our JBF Community (made up of consignors, friends, and shoppers)! Our sale doesn't work without YOU! You DO NOT have to consign to help out and shop early! Non-Consignors - Be sure to check out the Inspection/Organizing and Dad Dream Team *Double/Triple Credit* shifts below! You DO NOT have to be a consignor to help and shop early (just choose a shift before the Thursday, April 11th Presale starts at 12pm)! Our team helps with everything from event set-up, being the cheerful inviting face seen when JBF'ers enter the building, inspection, organizing merchandise, manning a cash register, helping as a bagger, helping at pick-up, and breaking down the event. Simply click "Login to Add Shift" to the right, then sign-in (or create login), then check the volunteer box to select your shift. Shifts are now available in 2,3, and 5 hour increments. You can make up to 15% more on your Consignor Check! HOW THIS WORKS: You can build your own shift! Just click HERE and choose which shift works best with your schedule. Combine shifts to get the total number of hours you desire!. 2hr Shift - You will receive 63% profit on your sold items. WANT MORE INFO? CLICK VOLUNTEER PERKS FOR FULL DETAILS! WHY JBF AND HOW TO CONSIGN? START HERE! =>FULL JBF CONSIGNOR GUIDE!! On average, JBF shoppers earn over $300-350​​ per sale! LIVE sale tracking! You've been warned, it's addictive! Our unique Mobile Talk-to-Tag allows you to tag your items on your phone using your voice! Our sales are clean, friendly, super organized - all with a focus on making it smooth and easy for shoppers to find and BUY YOUR stuff! We are a part of the leading children's and maternity consignment sales franchise is North America - JUST BETWEEN FRIENDS! Did you know your JBF consignor number and can be used at any of the 150+ JBF sales across the country? Now for the fun part - getting all of that clutter out of your house! Bring your best and make sure it is clean, without stains or holes, and in working order. Be sure to schedule your drop off HERE! 1. Sort, prep, and price your items at home (see details below) and bring them to the Nashville Fairgrounds ready to be SOLD! 2. Bring your signed Consignor Waiver, Car Seat Waiver (if applicable) and Crib Waiver (if applicable). 3. Check in and we will provide you with a rolling rack* to transport your "stuff" into the building. Following inspection, you will place all items on the sales floor, so please plan to allow 30-45 minutes for this process depending on how many items you are selling. *Limited racks are available. IMPORTANT: Pre-sort your items for Drop-Off: Please have your clothes hung on hangers, sorted by gender and size before you arrive for drop-off. Mark all of your items for Discount & Donate and you will qualify to drop your items off and go! No waiting! No Lines! No Problem! You have a choice! You may Donate or Pickup your unsold items. 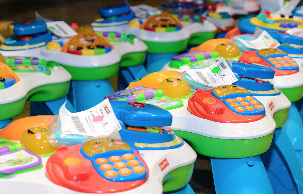 Donated unsold items are tax-deductible and you will be able to print a receipt. Please ensure you have arrangements for either you or someone on your behalf to pickup your items during the designated times. At 7:01pm, we will be loading the donation truck and any items remaining will be donated - no exceptions. WHAT DO WE ACCEPT for the SPRING/SUMMER? • KEEP - items that you aren't ready to part with yet. Maybe you're thinking about having another child or maybe the item is too sentimental. That's ok! Keep it. These items may also be for the next season - not this upcoming sale. • TOSS - Items that don't meet JBF Standards. This is typically your donate pile. When you're done set aside the KEEP tub and revisit it later. Take the TOSS tub to your local charity, repurpose the items or throw them away. The SELL tub is now ready to tag and prep!! You Ready?! Group all the (size 2) pants together, size 2 dresses, size 2 outfits, etc. Optional - further organize by brand (Basic/Discount, Chain store, Premium, Designer). See Pricing Guide. TIP: Hang size NB to 5T on infant/youth hangers, hang size 6 and up on adult hangers. ALL hangers accepted. Go ahead and check for recalls now, before you go any further. Gather all the accessories and manuals and place with the appropriate large items. Gather ALL the pieces and parts for your toys and bag them up and put them together with the appropriate toy. Test ALL toys to make sure they are in working order and have batteries. Be sure to put puzzles and games in their appropriate box. Make sure ALL pieces are there. VERY IMPORTANT: Make sure everything is CLEAN (even the soles of shoes - Magic Eraser works wonders), and in LIKE-NEW condition. Successful sellers at JBF practice "Shopper-focused Pricing". Ask yourself, "What price would make me buy this item and brag about it to a friend?" Try to resist pricing on sentimental value. To sell more items we recommend that you let your items reduce during our HALF OFF DAYS. It helps tremendously to start tagging items as soon as you can, that way you can pace yourself instead of being overwhelmed the day before drop-off. See this helpful Tagging Timeline Chart. Bring your tagged and prepped items to the Nashvile Fairgrounds - Exhibitors Building. • You'll be responsible to place all of your items on the sales floor in their designated places. • Volunteers will be on hand to assist you so you'll know where everything goes. Print your tags on light colored CARDSTOCK ONLY You can also change your printer to just black and white. If you choose to do this, please color the stars in with red marker. Select: Household items that other families will use (no knick knacks please). You may consign storage solutions (baskets, bin, shelving), furniture (no upholstered items), regifting items, craft items, decor (lamps, wall hangings, no antiques), and kitchen items (small appliances, utensils, etc.). Please be aware, we will be VERY picky about which items are allowed for the Mommy Mart. Price: Price to sell! These items are not the primary reason shoppers come to JBF, so set the price very low! These forms will assist you in preparing your items for Consignor Drop-off! VIP TAGGING REGISTRATION IS CLOSED FOR SPRING 2019! Got the STUFF, but don't have the TIME?! Overwhelmed? We designed our VIP Tagging Service with you in mind. Our VIP Tagging Service is now open! Do you want to consign, but don't have the time? Let us do it for you! Our group of taggers will prep, tag, and deliver your items to the sale - just sit back, watch your sales LIVE in REAL-TIME and your eCheck will be emailed to you in 10 to 14 days. Is there a fee & how much do I have to consign? There is a $20 VIP Consignor Fee (No Upfront Costs - it is taken out of the earnings check after the sale). The VIP fee covers the ink, cardstock, printing, safety pins, zip ties, a few other basic supplies, administrative duties, advertising, tagging, storage and transport to the sale. Minimum is 25 acceptable items or NO maximums. After I sign-up what happens next? VIP Consignors will be contacted within 48 hrs to schedule a drop-off or pick-up. How do I prepare my items to make the most money? ALL items must be CLEAN and if in working order with all its parts!VIP Consignors must SORT clothing (by size/gender) and HANG on appropriate size hangers. =>The VIP Consignor receives 50% of their earnings assuming clothes are SORTED (by size/gender) and HUNG on appropriate sized hangers. Outfits should be grouped together. Items like toys with parts are grouped together. TIP: Size Newborn to size 5T works best on infant or youth hangers, and size 6 and up works best on adult size hangers. =>If you DO NOT hang/sort your clothing or sort toys, your percentage will be 45% and you will be charged an additional fee of .10 per hanger (unless you provide hangers). Do I get to review the taggers prices? After everything is entered you will have 48hrs to review and request changes. Who takes them to the sale? Our VIP Taggers will deliver your items to the sale and you have the option to donate them ALL to our charity partners or pick up your unsold items during our normal consignor pick-up time. VIP Consignors that HELP at the event at least 3 hrs can earn up to 5% more. VIP Consignors SHOP the Presale is Thursday, April 11th at 4 pm (Helpers shop way earlier) and the 50% Presale on Saturday, April 12th at 6:30pm. If I don't donate, when is pick-up? Consignor Pick-up is Monday, April 15th from 4-7pm. No Exceptions. NOTE: Spaces are very limited, and it is on a first come, first serve basis. Items must be received by the tagger within 7 days or you will lose your spot. Don't be intimidated by consigning. It's really easy once you consign the first time, and we are always available to help you! The success of our Consignors is important to us! That's why we have a support system to help you whether you have been consigning for years, or this is your very first time! Join our private Consignor Facebook Group and be connected with us and other consignors to get questions answered fast at JBFRocks! Check out this entire page - it is jam packed! Watch our videos on how to tag everything!